Color(s): Fawn; with or without white chest markings. White; with or without orange markings. 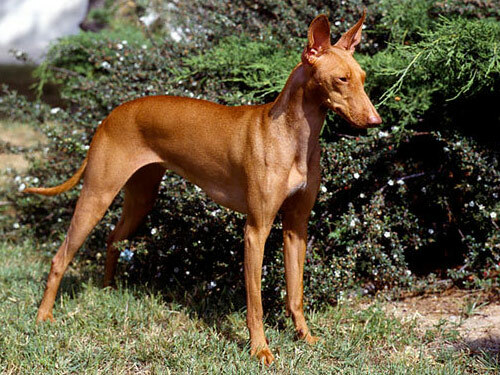 Originating in Italy, the Cirneco dell Etna bears a strong resemblance to the Pharaoh Hound. A sight, sound, and scent hound, this breed is extremely rare, difficult to obtain, and is not commonly seen out of its native island of Sicily. A primitive breed, the Cirneco dell Etna is of slender and elegant build. Despite their lithe appearance they are well-muscled, strong, and hardy. Their most distinctive feature are the ears which are set very high, rigid, and erect. Cirneco dell Etna's are agile, swift, and possess the uncanny ability of steathily stalking and catching their prey with absolute silence. The Cirneco dell Etna breed is not recommended for inexperienced or first time dog owners. The Cirneco dell Etna possesses a strong, independent personality. They are affectionate, loyal, and lively companions. They do well with children and other pets they have been raised with from puppyhood. However, they are reserved and aloof with strangers and pets they do not know. They are exceedingly alert and watchful, but are not typically aggressive. Occasional brushing with a firm bristle brush is recommended for the Cirneco dell Etna. Bathing should only be done when necessary. Due to the rarity of the breed there are no known health issues. The coat of the Cirneco dell Etna is glossy, harsh, and short. The Cirneco dell Etna is intelligent, dominant, and requires early and intense socialization and obedience. They will not respond to harsh or heavy-handed methods. Training must be done with firmness, fairness, patience, and consistency. Cirneco dell Etna's require an inordinate amount of physical exercise and mental stimulation. They are not recommended for city or apartment living. The Cirneco dell Etna does best in a rural setting where there is ample acreage to roam, hunt, run, and play.